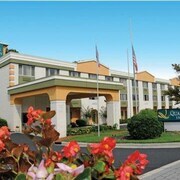 Situated in Huntersville, this hotel is within 1 mi (2 km) of Discovery Place Kids and The Park - Huntersville. Joe Gibbs Racing is 1.6 mi (2.5 km) away. 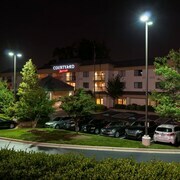 Situated in Huntersville, this hotel is within 1 mi (2 km) of Discovery Place Kids and The Park - Huntersville. Joe Gibbs Racing is 1.3 mi (2.1 km) away. The staff was excellent. They were all very friendly and helpful. The breakfast was good and never too crowded. The pool was nice and very clean. Where to find Huntersville hotels near an airport? Where can I find hotels in Huntersville that are near tourist attractions? From the budget level to the more luxurious, Huntersville offers loads of first-rate lodging choices. Spend some time checking out our 22 hotel options, which are all within a 0.1-kilometre (0.06-mile) radius of downtown Huntersville. Convenience is important when it comes to stress-free vacationing, so check out the latest offers at the Hampton Inn & Suites Huntersville and Best Western Plus Huntersville Inn & Suites Near Lake Norman, which you'll find within 1 kilometre (0.6 miles) of Huntersville's heart. For those chasing economical places to base yourself, you might like to try the Quality Inn, Huntersville Inn & Suites and Candlewood Suites Huntersville. 20 kilometres (12 miles) away from the center of Huntersville, is the The Ritz-Carlton, Charlotte. 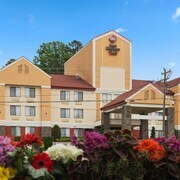 The Great Wolf Lodge Concord Charlotte is located 14 kilometres (9 miles) away. Some more hotel options in the area include the Hampton Inn and Suites - SouthPark at Phillips Place and the The Westin Charlotte. If you have the time, why not broaden your horizons and check out the many other attractions to be found in Western Piedmont while you are in the region? Western Piedmont offers foothills and tablelands, and commonly visited Western Piedmont sights include historic mansions. In this part of United States of America travelers may partake in hiking and cycling. 12 kilometres (8 miles) away from Huntersville is Lake Norman, where you can spend the day enjoying Lake Norman Visitors Center and Jetton Park. 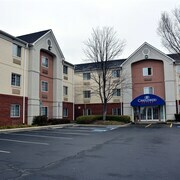 Expedia-listed Lake Norman hotels and accommodations are the Homewood Suites by Hilton Davidson and SpringHill Suites Charlotte Lake Norman/Mooresville. 20 kilometres (12 miles) to the south of Huntersville, you'll also find Charlotte Center City, home to the The Dunhill Hotel and The Duke Mansion. The ImaginOn: The Joe and Joan Martin Center and EpiCentre are popular places to check out for those visiting Charlotte Center City. Get your fix of local sport by taking a trip to Charlotte Motor Speedway, which is 17 kilometres (10 miles) to the east of Huntersville. 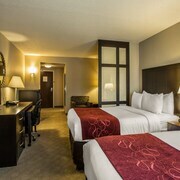 For tourists who are interested in booking a bed close by, make a reservation in the Embassy Suites Charlotte-Concord/Golf Resort & Spa or Holiday Inn Express Hotel & Suites Charlotte-Concord-I-85. Located 20 kilometres (14 miles) away from Huntersville is Charlotte-Douglas International Airport. Stay nearby at SpringHill Suites by Marriott Charlotte Airport or Renaissance Charlotte Suites Hotel. What are the most popular Huntersville hotels? Large 3 BR 2.5ba House in Birkdale Village,close to Charlotte and Lake Norman! Are there hotels in other cities near Huntersville? 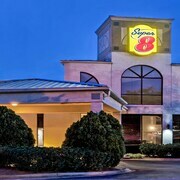 What other types of accommodations are available in Huntersville? Explore Huntersville with Expedia.ca’s Travel Guides to find the best flights, cars, holiday packages and more!